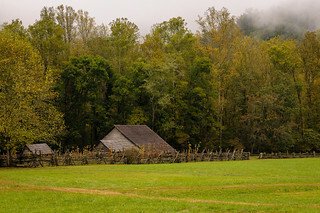 Located near the Oconaluftee Visitor Center, on the North Carolina side of the Great Smoky Mountains National Park, the Mountain Farm Museuam hosts a collection of historic log buildings. The buildings were collected from different sites in the Smoky Mountians and brought here to serve as an example of life here more than a century ago. Camera RAW image captured with a Nikon D300 camera fitted with a Tamron 28-75mm f/2.8 lens. Basic post-processing (camera and lens profiles, white balance, level adjustments, etc.) made with Adobe Lightroom Classic CC.